If you wanna know what a day in Abbas’s life is like then check him out on Bebin TV, a new online television station, at www.bebin.tv. You can find Abbas in the VPOD section of Bebin TV. 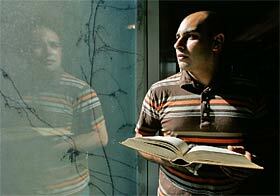 Abbas Kazerooni, who left Iran at age 7, is now 28 and a student at California Western School of Law. Also an actor, Kazerooni’s first book, “The Little Man,” is about his life. Their plan was for Marzieh to take Abbas with her to live with relatives in the United Kingdom and for Karim to join the family sometime later. Abbas Kazerooni couldn’t have known, as he stood in Tehran Airport trying to coldly hold back tears as his mother wept and hugged him tightly, that it would be the last time he’d ever see her. The 7-year-old also could never have fully understood that he was about to take his first steps into a world filled with grown-up horrors that he would have to handle all by himself. His parents, Karim and Marzieh Kazerooni, were desperately trying to get their son out of the country before he turned 8 and became eligible for the army. The threat of war with Iraq was looming, and the Kazeroonis feared their son would surely be killed. But on this day, airport authorities informed the Kazeroonis that Abbas was the only one who could leave Iran. That meant if he were going to join relatives in the United Kingdom by way of Turkey, he would have to do it all on his own. And Marzieh’s fears for her son nearly tore her apart. Now, two decades later, still haunted by memories, Abbas, 28, a professional actor and a student at California Western School of Law, has written his first book about his life. “The Little Man,” published by Tate Publishing, LLC, and selling for $17.95, is the first of a two-book series and includes the scene at the Tehran airport that Abbas says remains one of his hardest memories with which to make peace. His mother died suddenly of a heart attack three years after that day. And the guilt, sometimes, is almost overwhelming. “Now looking back, I wish I hadn’t done that – stopped myself from crying and holding her,” Abbas says with glazed eyes. “My mother began crying and crying; she became more hysterical than I’d ever seen her before. And my father (ordered) me not to cry or (show any emotion) that would further upset her. The book, Abbas says, is dedicated to his mom. But the chemistry between a mother and her son is not its only theme. Somewhere, after finally landing in Turkey, where a sleazy so-called friend of his father immediately left him on his own, the young man picked up moxie. He did odd jobs in and around the place where he stayed. He also deftly budgeted the sizable chunk of cash his father had given him after withdrawing savings and hocking nearly all the family’s possessions. And, with long-distance help from his father, he used persistence and charm to enlist the help of an official in the British Consulate to finally get him to England after four months in Istanbul. In his adopted new home, where one of his older cousins and his wife would adopt him (making him a naturalized British citizen), Abbas picked up more than an accent. Abbas became a high-achieving student athlete with a focus on performing arts and law. He has acted professionally in theater, on the radio and with the BBC, HBO and other television production companies. He had a role in the 2004 HBO production of “The Hamburg Cell,” a fictionalized account of the 9/11 hijackers. “The Little Man” touches on all of that. But although the writing was cathartic, it couldn’t lessen the pain of certain memories: that scene in Tehran Airport; his grade school days soon after he learned of his mother’s death; and one of his darkest nights in Istanbul. At 7, nearly 8, Abbas had become streetwise, but not streetwise enough. He headed unaccompanied to a food shop after hours. Before he got past a dark alley, a drunken robber grabbed him, bashed him against a wall a few times and drew blood, pressing a knife to his neck before taking a meager sum of money. An adult who had befriended Abbas may have saved his life when he came into the alley searching for the youngster and scared the mugger off. He says he strongly believes that his life has made him a strong person. But every so often he asks himself: “Was it all worth it?” Did his family’s decision actually save him from certain death in the Iranian military? But all that is food for the second book, he says. Check Out The Little Man in Namak Magazine…. You can now read about The Little Man in OCPC MAGAZINE… Don’t FORGET TO buy your copy this month!!! We like to thank OCPC for their gracious efforts in bringing you the story of The Little Man. Should you have read and enjoyed the story of “The Little Man,” and feel that others can benefit from reading this story, we would appreciate all your support in making this book reach a wider audience. As a result K4 Productions is having an Oprah Campaign and would appreciate your help in reaching our goal. We ask you to either write your own comments and thoughts or e-mail your thouhgts to The Oprah Winfrey Show. You can either do this in your own words or you can use the canned e-mail we have provided below. Should you wish to use the canned e-mail below, please copy and paste it with your e-mail using the link provided. Also, you can use the link below to send Oprah a message to have Abbas on the Show at her “Your Must Read List” section. The link is below and requires you to sign in. Please feel free to write on her message boards about the book. Thank you once again for all your support. I believe that your show is one of true inspiration and one that provides hope for those that most need it. Recently my attention was brought to a book entitled “The Little Man” by Abbas Kazerooni. This is a true story about a seven year old boy who was forced to escape ALONE from his home country. In the four months that he was left alone, he managed to overcome such obstacles at such a tender age which many adults would deem as more than challenging. This is a story that truly inspires and gives hope to those that may be in need or feel that life’s challenges are too hard to overcome. I believe that this book very much falls within your ethos and what you stand for. I feel that should people get to read this book they will feel an inspiration and hope that is often hard to portray in the cynical world that we live in. This is the first half of a story of a seven year old boy who was forced into leaving his homeland at that tender age. It is set in the mid 1980s amidst the peak of the Iran-Iraq War. The protagonist Abbas is forced into escaping to Turkey by himself in order to try and get to the West. At seven Abbas had to try and live in the worst parts of Istanbul while he tried to find his bearings. He had to learn how to be independent. He lived there alone for almost four months whilst trying to obtain a British visa. He did this in order to avoid being drafted into the army at a young age (like so many Iranians were). His parents did not want their son to die. Therefore Abbas lived alone, worked three jobs and overcame what were huge odds in achieving his goal of getting a British Student Visa. Amongst his trials and tribulations were attacks and manipulations by those who he lived amongst. He almost lost his life. This is a story of hope, determination and truly a sign that demonstrates that anything is possible if one has courage, will and true determination. Author Abbas Kazerooni is currently at law school in San Diego where he resides. He has a BA in English Literature with theatre and performance and also attended the London Academy of Performing Arts where he studies classical acting. Kazerooni has been a professional actor and writer (of screenplays) for 5 years before attending California Western School of Law. He has acted in films, theatre and radio plays. Most recently he appeared on TNT on “The Grid” and on HBO in “The Hamburg Cell.” Currently he is in pre-production for an up coming feature to be shot in the summer 2006 and the sequel to The Little Man.